Greetings, Feasters, and welcome to this Easter edition of Friday Feast. I hope you’re not overdosing on hot cross buns, and remember to be sensible with the chocolate on Sunday. Actually, on second thoughts, don’t. Go silly. Life’s too short to be abstemious. As my guest today understands! Emmie Dark is nothing like her surname. She’s light and lovely – just like her newly released debut novel Cassie’s Grand Plan. I know this because I’ve met Emmie. Over lunch, funnily enough. And today she’s sharing an amazing foodie travelogue, with lots of photos and gorgeous descriptions for us to drool over. Got a hot cross bun handy? You’ll need it because you’re going to be pretty hungry after this post. But before you start salivating over Emmie’s foodie adventures, feast instead on this! Tempting, huh? Well, you know what to do: shop! 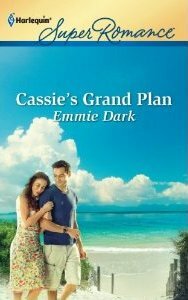 Cassie’s Grand Plan is in stores right now. You can also order direct from Harlequin, or from Book Depository and Amazon. Hi Cathryn! Thanks for inviting me to join you on your blog – it’s lovely to be here in such esteemed company! Not to mention being given the opportunity to talk about my two loves – romance writing and food. I’ve just returned from a trip in the USA. I’m fortunate enough to be able to travel quite a bit for my (non-writing) work and one of the perks is getting to eat in some amazing places. On this trip, I managed to have some amazing meals that were all wonderful – but for very different reasons. I know most people talk about their own cooking on your blog, but if it’s okay with you, I’d like to tell you about some of the foodie highlights from one of my favourite cities in the world: San Francisco. First up, breakfast. I’ve been to San Francisco many times, but on this trip I finally made it to Brenda’s French Soul Food – a San Fran icon, famous for its New Orleans-inspired cuisine. The menu, as you’d expect, is full of southern specialties like grits and biscuits. Can’t say I’m overly fond of grits, but the biscuits (pretty much an over-sized scone to an Aussie like me) were fabulous – light, fluffy and somehow just the right match for my omelette, potatoes and the sneaky but delicious sparkling rosé I indulged in. Intriguingly, the wine was served in a plain tumbler – which had no effect other than to make my indulgence less obvious to others! As for dinner? Well, there are so many wonderful places in San Fran it’s almost tough to have a bad night out. Let me tell you about two highlights. Le Colonial’s cocktails were fantastic – not only unusual combinations, but prettily decorated with fresh flowers too. I had something called a Gigi, which included Grey Goose vodka, St Germain elderflower liqueur, Lillet Blanc and a dash of sparkling rosé. Yum! While in town I was also fortunate enough to sample another San Fran icon – the Wayfare Tavern. Located in the financial district, even on a weeknight this place was pumping and due to our last-minute reservation we weren’t sitting down to eat until well after 9pm. Luckily the food was so good that even though I was feeling more like bed-time than dinner-time, I scoffed what I was served. The Wayfare is famous for its fried chicken, and so, of course, that’s what I ordered. The reputation is deserved! The chicken was moist, crispy, not at all oily and the coating wasn’t too thick. Served simply with some lemon wedges, it was the epitome of simple elegance – something I have come to appreciate when travelling and eating out every night. There’s only so many dishes of complicated ingredients and complex flavours you can take after a while. Sometimes you need something simple – but good. Wayfare delivered on both counts. I know that most of your guests contribute a recipe. Unfortunately given that I’ve spent my visit talking about other people’s cooking, it doesn’t really seem appropriate for me to provide one. However I will, if I may, give a plug to the SuperRomance Authors recipe book. The photo on the front cover is my zucchini and pistachio spice cake with lime frosting – you can find the recipe three clicks in. It’s my never-fail-to-impress baking star and not only does it look fantastic and taste amazing, it’s incredibly easy to make. Leave a comment and tell me about your favourite dining out dish and I’ll send one lucky commenter a copy of my debut novel, Cassie’s Grand Plan! Okay, I am officially jealous of Emmie Dark. Like, really, really jealous. How sensational did that sound? And check out the SuperRomance recipe book. There are some excellent recipes and Emmie’s cake looks and sounds beautiful. Now, see Emmie’s book up there with that gorgeous cover and enticing blurb? You could win it. All you need to do is share your favourite dining out dish. So you know the drill, Feasters. Get commenting! Giveaway closes midnight Tuesday, 10th April AEST. Open internationally. If you’d like to learn more about Emmie and her books, please visit her website. You can also connect via her blog, Facebook and Twitter. A fraction late with this announcement, but this giveaway has closed. Congratulations to our winner, Natalie, and thanks to all who to took the time to comment. Much fun was had! This entry was posted in Friday Feast and tagged Australian romance authors, Australian Writers, Cathryn Hein, Easter, Emmie Dark, Food, Friday Feast, promo, San Francisco on April 6, 2012 by cathrynhein.